Oh my god… Oh my god…Those were not only the last words uttered by Princess Diana at the back of a Mercedes, but the only words I could muster on first hearing this full-blown-no-doubts-about-it MASTERPIECE. It’s just so incredible and undeniably perfect, that I just can’t get this stupid grin off my face. If you’re not immediately hooked by those weird slowed-down intro vocal effects, the loud and I mean LOUD guitars, the thumping beat, the mother of all catchy tunes, the inane lyrics, you’re reading the wrong Blog. This is like Pantherman in a monkey suit running Jungle Jim out of town. Douglas Westlunds was in fact the drummer on some weekly Swedish TV show , but one night he stepped up to the mic and performed this number. Sweden went nuts, the phone system melted and he was offered a contract to release the song on the spot. 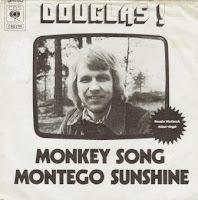 It became a semi-hit, and as far as I know Douglas wasn’t heard from again. I would love to hear different though…Credit where credit is due. The superb loud production is by Mats Olsson and Monkey Song is written by Jorgen Larsen. BTW, as expected, the B side is not worth throwing or waving your banana at. Thanks to Eddie for turning me on to this incredible single. 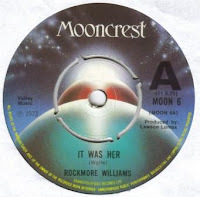 Mr. Williams, or Rockmore to his friends, unleashed these two gritty semi-Glam rockers into oblivion and probably didn’t release anything else using this pseudonym…He reminds me a bit of Peter D. Kelly and Lady Rock would have certainly been more than a suitable follow –up to Rock To The Jukebox. 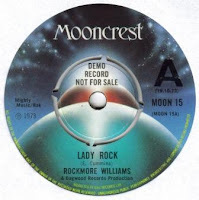 It Was Her has a neat descending horn riff à la Elected and you can nearly hear his medallion bouncing off his hairy chest…So who was Rockmore Williams? 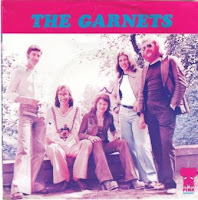 Although written and produced by J. Vincent Edwards, The Garnets seem to have been a bunch of mutoid Belgians, who never having fully recovered from losing the Congo, went West and ventured into Redbone territory with this fine single. While lacking the full on assault of Propeller’s Apache Woman or Abacus’ Indian Dancer, Indian Reservation is simply full on stupid, but oh so marvelous…Highly recommended with no reservations whatsoever…Teenage Summer Crash Course on the other hand is an OK-Glam-by-numbers rocker but sounds rather out of breath and middle-aged. 'Rock scribe (John Mendelsohn) wants to be a rock star - insider joke band makes nice early glam, pre-punk sound'. 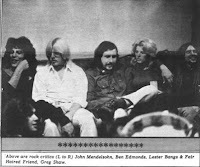 For those not in the also-ran know, John Mendelsohn was perhaps the ultimate early 70’s Anglophile (Muswell top-ranking!). All pop, no style, John’s strictly roots journey to superstar writer-DUMB began with a notable stint beating-skins with the embryonic Halfnelson (soon to become Sparks) before graduating to out-and-out skin-(flute)-suckling with his own hype L.A. fashion band, Christopher Milk (whom he promoted ceaselessly in nearly every record review he scribed). Brendan Mullen tried to pass them off as ‘proto-punk’ in the pages of his poor-poor-very-poor, We’ve Got The Neutron Bomb, which, like most everything else contained in said narrative, failed to hold enough water to drown a newborn kitten or enough substance to fill a pot-hole. Not even known good-guy Gregory Shaw had much positive to say about ‘em (even though he did allow Mendelsohn liberty in 1977 to turn in a truly horrific EP as The Pits which was so embarrassing most BOMP discographies today will not even acknowledge its existence or shouldn’t anyway!). So…on the threshold of such a dreamy ‘n’ positive introduction, what – really – are we left with? Pick To Click: ‘Hey, Heavyweight! Click below for the 3 minute mono edit of Hey, Heavyweight! This is not the Rockabilly Revival outfit, but the sounds of Ex-Rupert’s People (Reflections of Charles Brown) members Rod Lynton and Steve Brendell soldiering on into the early 70s. 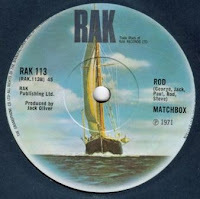 Rod is in fact the B side of a pleasant up-tempo Bubblegum/ Pop number and is a strange beast indeed…Based around a rockin’ backbeat and pop vocals, they then added these weird oscillator/Theremin or Moog gurglings. The overall effect is bizarre and sounds like this was done more as a playful after-thought rather than through astute planning. 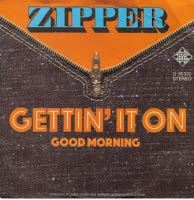 This is one of the other Zipper bands, NOT to be confused with Atkins/Morris or Fred Cole! For your entertainment, I haven’t compressed the picture, so if you click on the image you can see it in full wide dorkscope…The cover nearly gives Frog a run for its money, as for the track itself…er…Barrel-house Glam anyone? Tony Atkins and Gerry Morris strike again with these two left-of-field Glam Stompers. The A side is not as straightforward as first seems with its out there production, similar to Galahad’s Rocket Summer. The production on Good Morning is even more over the top and approaches near Experimental-Trans –Progressive -Glam with layers of backward guitars and snare effects. What a team! BTW, this is not the Life of Riley mob, nor the band that issued Can Can (which reminds me, I should upload the cracking French Pic Sleeve of that one…). There’s also another Zipper on Youngblood from around the same time, but I can’t confirm any Atkins/Morris involvement there. 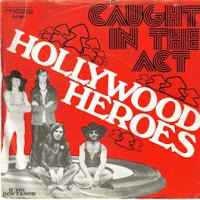 Caught In The Act is a wonderful hybrid of a tune juxtaposing My Sweet Lord onto a rockin’ Summertime Blues beat with 10CC/ Beach Boys backing vocals and acoustic/Dobro slide. 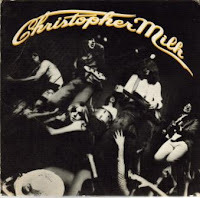 The single is perfectly produced by US Actor/Producer Steve Rowland better known for his production duties with Dave Dee, Dozy, Beaky, Mick & Tich and to a much lesser extent Ace Kefford’s Rockstar single. It’s a total mystery as to who the Hollywood Heroes actually were, if they existed at all. 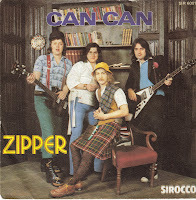 Unless proved otherwise, it looks like the guy on the left in the hippy dippy floppy hat is Steve Rowland. 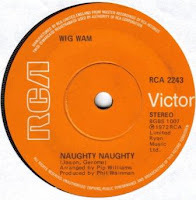 The A side is written by Alan Hall, the B side by Ken Watson if that’s any help…Caught In The Act has all the necessary ingredients and really deserved to be a hit.